KLIMS18: Perodua teases new SUV model - expected launch in 2019; based on seven-seat Toyota Rush? 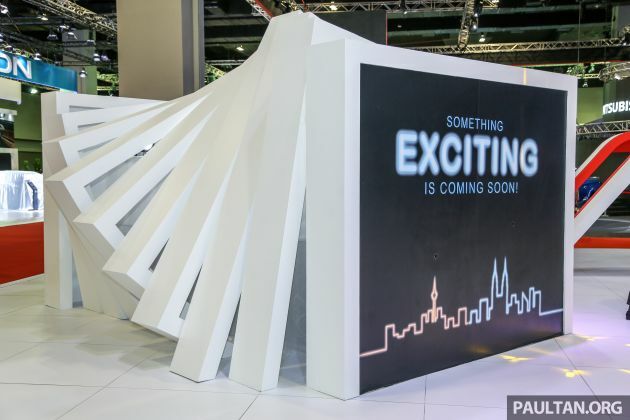 Home » Cars » KLIMS18: Perodua teases new SUV model – expected launch in 2019; based on seven-seat Toyota Rush? KLIMS18: Perodua teases new SUV model – expected launch in 2019; based on seven-seat Toyota Rush? Fortunately, we do get to see glimpses of the model through a few carefully drilled holes and partially transparent fabric, giving us some idea what it might be. Based on our observations, we can speculate that this will be Perodua’s upcoming SUV codenamed D38L. Looking at the details, the Perodua SUV appears to be based on the latest Toyota Rush, although we expect some design revisions (bumpers, grille, wheels, etc.) to differentiate them. As far as we can tell, the look of the SUV’s headlamps, taillights and side mirrors are all almost identical to what you’ll find on the Rush. As the top half of the car is completely covered off, it’s impossible to get a good look at the interior of the model. However, going on the premise that the Perodua SUV is indeed Rush-based, we should expect seating for up to seven. Like the exterior, the cabin should be similar to the Rush, which curiously already comes with Perodua-esque touches like the handbag hook, driver seat USB charging port and others. As for what’s under the bonnet, a strong likelihood is a 2NR-VE 1.5 litre naturally-aspirated four-cylinder petrol engine with Dual VVT-i, which is found in the Rush, Avanza and the Myvi. Output figures for the mill are 105 PS at 6,000 rpm and 136 Nm of torque at 4,200 rpm on the Rush, with drive going to the rear wheels via a four-speed torque converter automatic. With this teaser, it’s clear that the Perodua SUV will not be launched at KLIMS, reinforcing what was mentioned during our interview with Perodua Sales managing director Datuk Dr Zahari Husin in June. A 2019 launch debut is a lot more likely at this point, but stay tuned for further updates. For now, what are your thoughts on the Perodua SUV? 7 seated SUV using the same engine as Myvi? Can it still be a supercar? Make a lot of noise under hard acceleration so good enough to consider as supercar lor. Toyota Rush real world FC is so-so according to Philippines reviews of it especially in city driving. A side effect of using that 1.5+4AT on a 7 seater. EEV certification is nothing more than just marketing nonsense to make the brochure a bit sweeter to people who don’t know any better. Who cares what the Filipinos think. They dont know anything. According to Indo reviews, it consumes petrol like a tank but not built like a tank. X70 all da way yo! Do you mean Thank you, next? Come on la PERODUA, tease what tease ?? This just a rebadge daihatsu terious. All of know know the car looks like already. Even thought I hate proton, but the B segment suv market going to dominate by proton SX11 in 2019. Who still use stupid 4 speed auto nowadays ??? Kononnya nak reveal sikit sikit pasal proton la hoping that the public will ask. Which segment is Proton dominating now? “dominate by proton” konon. Dominate by Proton? What X70? SX11? Not all people want buy SUV… Now SUV is dominated by Honda… And Who want buy 7 seater that 3rd row for kid only lorh.. this Perodua 3rd row seater is for adults.. this is the real 7 seater..
Its a space cop gaban. Tease here, hide everywhere. Why still waiting for Matt to come home from Mars then only reveal? Better than preview everywhere but take ages to be officially for sale. Overhype chr and proton x70 to name a few. no need to peep here peep there, no need to guessing, PT already put many photos of rush here………. No need concept la if it’s just Terios rebadge. Rebadge is only what Perodua can do. Toyota famous with under powered vehicles.Just drop this car.It won’t sell well.Nissan XGear even more powerful.